Main board is equipped with 7 analogue inputs that are able to measure different states on the sensors by using just one wire. Well actually you need three together with power and ground. On the right you can see the wiring schema. It is a simple voltage divider with 22k and 10k resistor that take the input voltage and create different voltage levels based on state of PIR outputs. 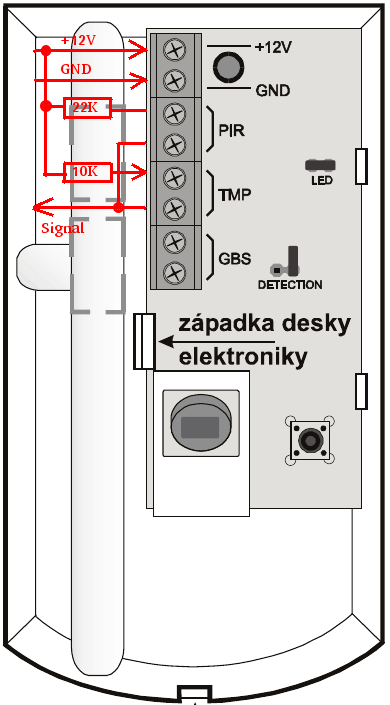 In this way we can use any commercially available PIR sensor module that is able to operate with 12V power supply. There can be more sensors on one input, but that would require more than just three wires as you need to daisy chain the signal and signal inputs from PIR and TMP. Not problem for someone who is using CAT5e cable to wire the sensors, it is actually cheaper than original 4-wire cable. 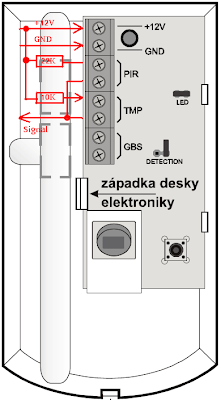 In software we measure the voltage level in zone thread every 250 millisecond. 4 times a second is safe way as the PIR modules usually keep the outputs on or off for one whole second. Also the thread has highest priority. In order to compensate for different wire lengths, there are voltage rages feedback specified for each state, rather than a single value. And because input voltage can change when switching to battery and back, the whole measurement is compensated to the input voltage as well.